This line from King Lear is part of the title of a 1999 lecture by Dr. Joanne Stroud, one of the founders, along with James Hillman, of The Dallas Institute of Humanities and Culture. Lear: Who is it that can tell me who I am? The exchange is a fitting lead in to Stroud’s lecture which centers on ideas of identity in the western tradition, especially in Jungian psychology. For Jung, “the shadow,” comprised of the disowned parts of a person or culture, is one of the first archetypal energies we encounter when we begin to look within, hoping to find out what and who we are. I recommend Stroud’s transcript for its outline of Jung’s ideas as they bear on the western imperative, “Know Thyself,” which was inscribed at the entrance to Apollo’s temple at Delphi. I’m guessing that the question “Who can tell me who I am,” is an undercurrent in the lives of everyone who has read this far. In addition to our own introspections, don’t we ask friends, teachers, novelists, religions, therapists, books, and even politicians in certain election years? There is much to be learned from these sources, information that’s useful when choosing a career, a spouse, a place to live, or when plotting a novel or writing a poem. But that’s not what Lear asked or Apollo demanded at Delphi. The answer to the question of identity is like a rainbow, sometimes visible on the horizon, but elusive no matter how we chase it. The time comes when we have to ask the Dr. Phil question, “How’s that working for you?” Could it be that “identity,” as it is commonly imagined – as a kind of cosmic birth certificate – cannot be found? Reading that, I always think of meeting new people in social settings. “What do you do?” is usually one of the first questions. Do you ever resist being pigeonholed when that happens? At such moments don’t we understand that “I” am more than my roles and my vital statistics. 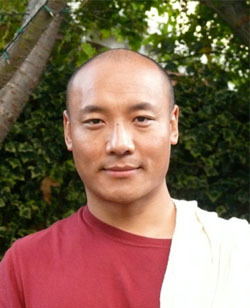 Anam Thubten would add that we are greater than all our ideas of identity, which are just more sophisticated pigeonholes. Next time I will try to describe the simple ways he invites us to drop our stories long enough to glimpse the reality that lies behind them. If that’s biting off much more than I can chew, at least it’s easier than trying to answer Lear’s question. This entry was posted in Buddhism, Psychology, Spirituality and tagged Anam Thubten, Buddhism, King Lear, Psychology, spirituality. Bookmark the permalink. 6 Responses to Who is it that can tell me who I am? It’s a great illustration of propinquity. That really is interesting. “The idea was in the air.” Something I understand Edison said when complemented for one of his inventions. Thanks for this good post, Scott. I’ve always been fascinated by Lear (and the father-daughter relationships, myself the youngest of three daughters) – there’s so much in that story. But the identity question remains the key. I find it interesting that when I’m in Ireland, very rarely do people ask what i do – usually the question is, ‘where are my people from? what is my surname?’ I think what’s being asked, is “to whom do you belong?” which carries it’s own set of information. Morgan – my apologies for calling you Scott. Just back from a trip, so I will blame this on jet-lag. Pretty bad for a response on identity! Don’t worry about it – I just made a similar mistake here. Besides, I think the general theme is that “identity” is not as fixed and solid as we usually imagine it.